Nicosia (Cyprus), Nov 23: Reigning European Champions Real Madrid made an impressive appearance scoring six goals over Cypriot football champions Apoel in their Group H European Champions return match. The Cypriot team withstood Real's pressing up to the 23rd minute when Luka Modric scored the first goal on Tuesday, reports Xinhua news agency. 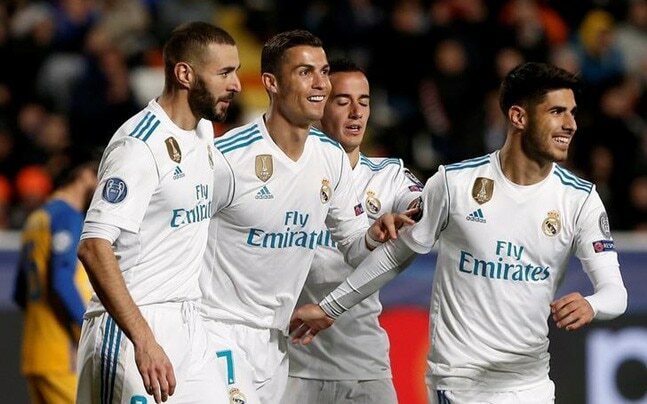 Karim Benzema scored twice in the 39th and in extra time in the first halftime, while Nacho Fernandez scored in the 41st minute and Cristiano Ronaldo capped the victory with two more goals (49 and 54). Real had won the first match 3-0 in Madrid. Despite their win, Real are still in second place of group H scoreboard with 10 points against 13 for Tottenham Hotspur, who got 3 more points from their away match with Borussia Dortmund on Tuesday. Borussia and Apoel have 2 points each, with Borussia holding the advantage with a better goal average. Apoel will play their last match away to Tottenham on December 6, and Borussia Dortmund are also away to Real Madrid on the same day.